This is the third year of Language Partners BC, a volunteer-run language organization in Vancouver. The project started with an influx of Syrian refugees in the winter of 2015-2016 and the idea that a partner-based language program might offer connections and solidarity between people in our city. Now, as we go into our third year of operation, it feels like time for a reflection on what’s going well, what ongoing challenges we face, and where the work may lead. In September we hosted a Community Languages Festival at Mount Pleasant Neighbourhood House. Listen from 1:00:23 to hear Mary speak about the festival. In the six years since tandem UBC — a partner-based conversational language program — launched at the University of British Columbia, its directors never expected to see it become the largest “tandem” style program in the world. "When you talk about something, about culture, about language.... It made us friends,"
Moving to a new city and making friends can feel like an insurmountable task — especially when you're also trying to get the hang of a new language. Coordinator of Language Partners BC, Mary, and program facilitator, Mamo, discuss how language exchanges can help with On the Coast at CBC. Language Partners B.C. students participate in the mixed Turkish-English program | Photo: Language Partners B.C. Focused on community-building and learning other languages in a small group setting, ‘profound’ new language exchange set to expand in New Year. Are you interested in learning Arabic or Turkish, and helping a newly arrived Syrian refugee or new immigrant learn English and adapt to life in Vancouver? Join this pilot program. 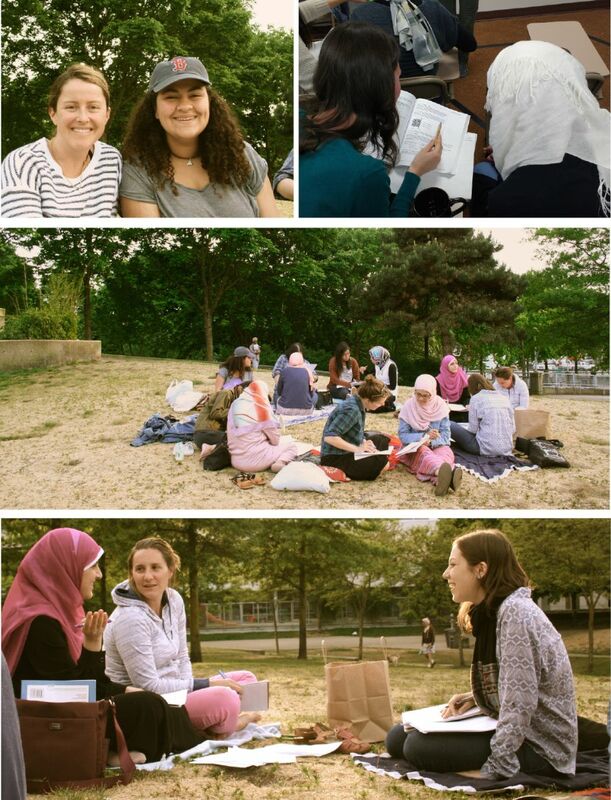 One sunny day, participants exchanged Arabic and English outside. Most language learners today are no strangers to phrasebooks, immersion programs, or Rosetta Stone, but how about using First Nations language learning apps, or watching ultrasound imagery to speak Cantonese, or adopting an Arabic conversation partner? In the wake of events in England and around the world, where more doors seem to be closing than opening, here, however small, is another kind of story. To those who would consider themselves hard-eyed realists, who feel the need for more doors, it’s laughably naive. The story’s name is Mary Leighton. One sunny afternoon, language learners took their conversation outside. Picture women from Syria, Egypt, Iraq, the United Arab Emirates, Canada, and the United States sitting on carpeted ground together, and laughing over plates of dates, melon, and cake. This was the scene on Tuesday April 14 as the participants of the an Arabic-English language exchange program stayed late at Ajyal Centre in Vancouver to celebrate Iftar–the breaking of fasting during the Islamic month of Ramadan–and to mark the successful completion of the first iteration of this new program. 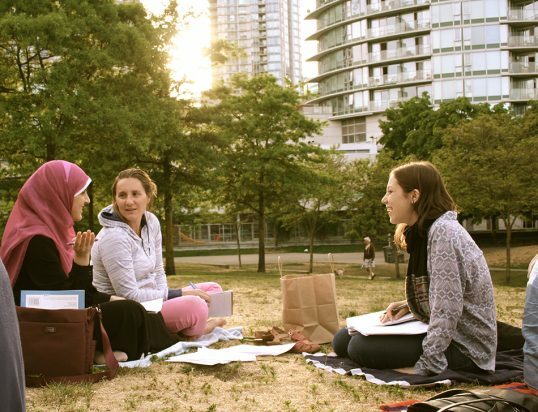 Neighbours Learning Together, an Arabic-English language exchange program designed to support Syrian refugees in Vancouver, is off to a great start. A little blog piece on the benefits of language exchange, beyond just learning language. With a photo of the admin team after our April 2016 information + registration session at Ajyal Centre! Administrative team from left to right: Marie Shuman, Viyan Petekkaya, Mary Leighton & Farah Hatim.